Okay, so here are some tips on helping to heat and/or insulate your tank for cold weather or just to help year round. 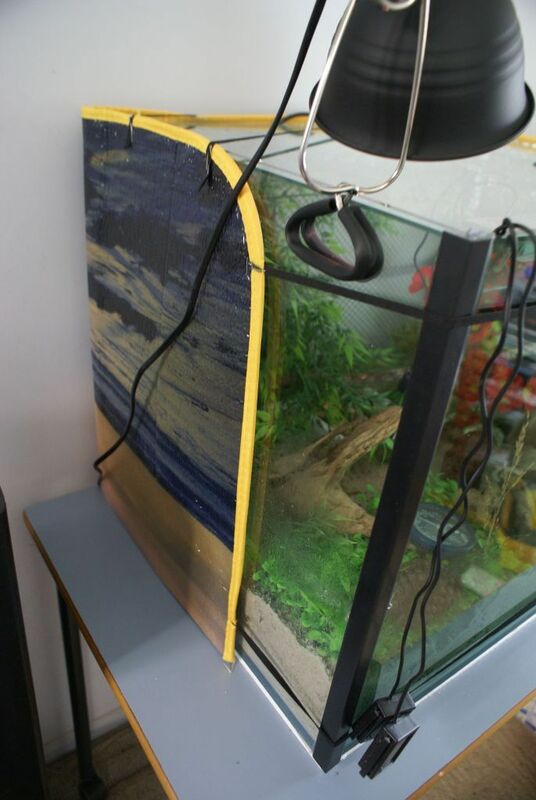 Something you can do when first setting up a tank (or with a smaller tank) is to tape cardboard, styrofoam or sheet plastic to the bottom of the tank, covering the back of the tank, and on the ends. When winter comes, I also tape cardboard on the front just as high as the substrate goes. It doesn't look pretty, but it helps & you could always color or add contac paper, wallpaper, tissue paper or pretty pictures if you don't want to look at cardboard all winter. *You can cut apart old boxes, no need to go buy cardboard. For this same purpose, you can also use insulating foam board, styrofoam or even bubble wrap or padded mailing envelopes. If your tank is in front of a window, you will want to insulate your tank against the cold air transferred through the glass. 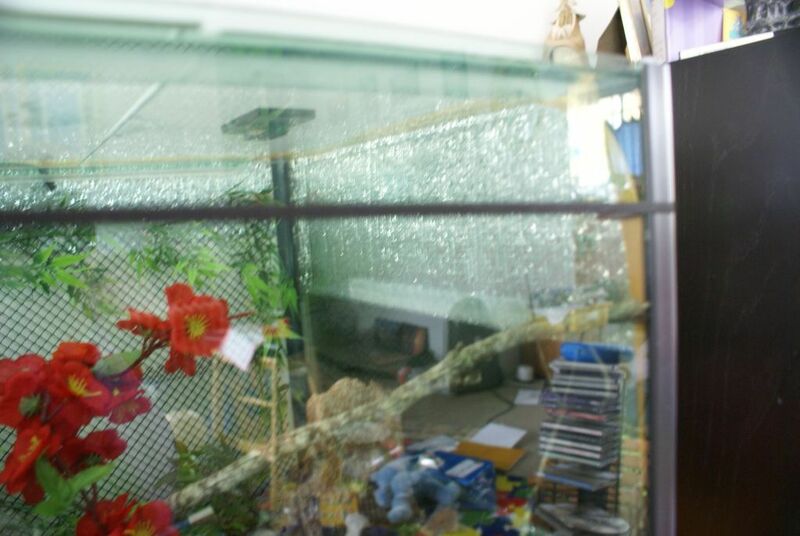 You can put cardboard,plastic, blankets, towels, an old sweater, etc between your tank & the window. This also helps even when the tank is near a wall. *Check your manufacturer's information as to whether your heat pad is safe to be insulated. Depending on what kind of lid you have, you can also put any of these things on your lid. I will lay cardboard or styrofoam on my lids as needed instead of taping it. Obviously blankets and towels will work too; either laid on top, draped over it or even wrapped around the tank. *Never drape anything on, over or near light/heat fixtures. Now for heat. 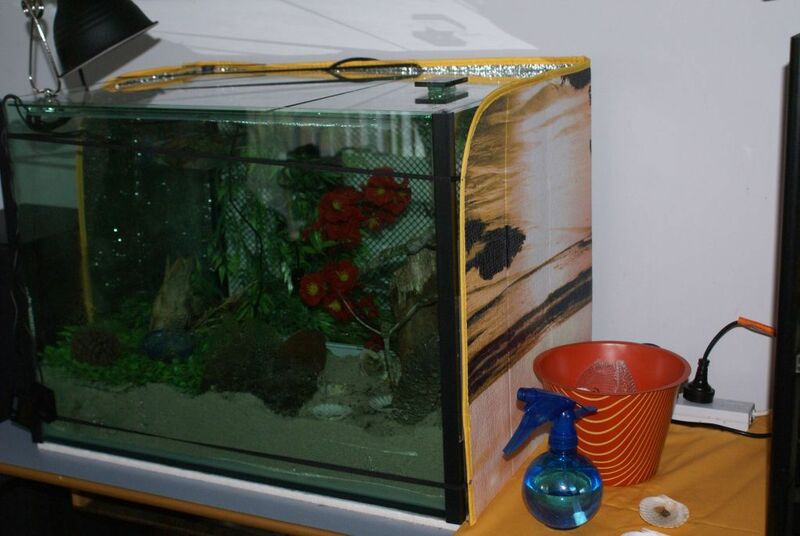 Obviously things like heaters (called UTHs or Under Tank Heaters) are ideal (these should never be placed under for hermit crabs, but on the end or back instead). But in a pinch, you can use a regular lamp or a clamp lamp & you can use a regular light bulb. You can use natural sunlight (having the tank near a window), but you have to be careful doing this not only because of the magnifying effect of glass, but you don't wanna bake your crabs. I have also found that putting a mirror behind your tank can help reflect both heat & light into the tank instead of letting it escape through the back & it also gives you a view of your crabs you may not normally get. In a pinch, you can use a hot water bottle, wrapped in a towel & placed in the tank. Whatever your heat source, the better your lid is & less it's open, the more heat you will keep in. I have cut down a car windshield sun shade and stitched elastic to the ends. It goes along the end that has the heat pad, the back and about half of the other end SILVER SIDE IN. The elastic goes around the rest of the tank at the top and bottom. So it doesn't really get in the viewing way as one lot is down where the sub is and the other right near the top of the tank. Think it is working well. I think I understand what you did but I am not sure. Heheh, do you think you could get a picture of it? It sounds like a good idea. The elastic doesn't intrude much across the front of the tank.This end has the heat mat. But there is a little one in the back as well. This end without the heatmat. This shows the top. The corner was gaping a bit so I put this on across the top. I don't tend to lift this section as it is bigger and has no handle. Is that what you imagined?? After doing this I realised that velcro tabs on the tank and the shade would probably have been easier. That's exactly what I thought you were describing. That is a great idea. I may have to steal it for this winter. I have tinfoil bubble wrap and then tinfoil taped over the back of my tank This would be easier to put on and remove. I like that idea as well. What other great ideas do you have for things? Heheh. Have a look at my post in second storey thread for something else new. He he, that is a good idea! I think I actually like the elastics better because you can shift the position of the heat shade. 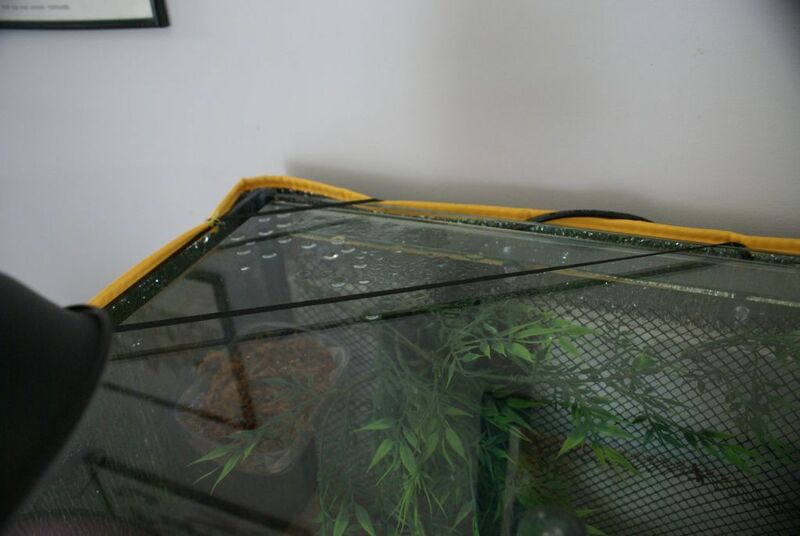 I have used foil before, but scared the bejeezus out of myself when the foil touched my wall plug & made a big spark,hh Right now I have some silver gift wrap taped to the wall behind my exotics' tank because they have 2 heat pads & even in summer it's a struggle to keep them warm enough. He he, that is a good idea! I think I actually like the elastics better because you can shift the position of the heat shade. Think before you click next time to avoid having to delete the pic. i too use towls and plastic wrap on the top of my lid's,i tape the saran wrap with packaging tape so it stays put,i love all of ya'll idea's. These are all great ideas. I may have to do some sort of cover like that over my UTH on the sides. I put a towel over and around my molting tank to keep the darkness in. 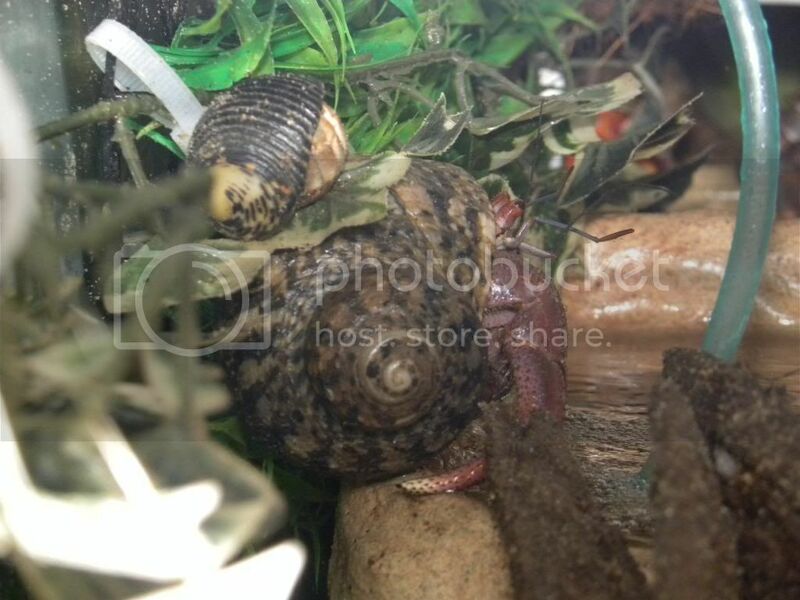 My 2 Jumbos have to molt in an ISO tank till I get a bigger tank with deeper substrate. But they are used to it, as I've been doing it for years, and their previous owner was doing it as well.